Samsung today announced that the Galaxy S 4 has hit 10 million in less than a month after commence of shipping, a few days after hitting 6 million on May 10th. That was on the 27th of April when it started selling concurrently in several countries across the world. This is estimated to be a rate of four units per second sold. This makes it the fastest selling smartphone by Samsung. Galaxy S III, the previous Samsung flagship of 2012 hit 10 million in 50 days while the Galaxy S II did it in five months, the first Galaxy hit the same milestone in seven months. This marks a new level of high and confidence in Samsung products amongst consumers. The flagship of 2013, Samsung Galaxy S 4 is now available in 110 countries and is headed out to the total 155 countries as was the objective of Samsung at launch. Overall, there were 327 carrier and partners aimed to sell the Galaxy S 4. While on that 10 million high, Samsung has introduced two other colours from the previous two. These are Blue Arctic and red Aurora ( See I wasn’t so wrong pedicting a debut of Garnet red version). Other colours coming soon are Purple Mirage and Brown Autumn, also captured by Emmanuel Chenze in this video. 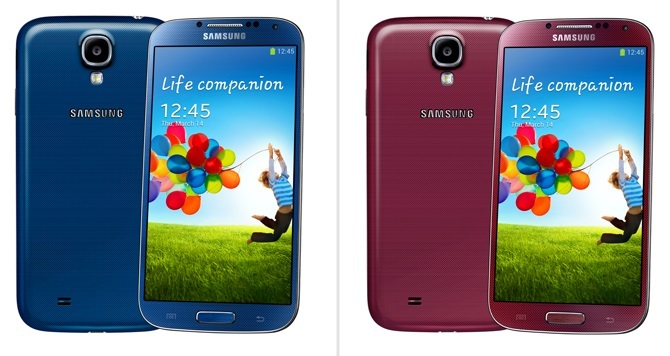 The Galaxy s 4 launched in two colours, the White Frost and Black Mist colour options.